From 10,500 feet in the air, Josh Ewing scans a vast desert landscape as white sandstone towers rimmed by red cliffs give way to a wooded plateau punctuated by the two namesake buttes of Bears Ears National Monument. The view in southeastern Utah is stunning in every direction as the airplane carrying four journalists and Ewing, executive director of Friends of Cedar Mesa, banks around the distinctive Bears Ears land feature and heads south along the deep gashes of Grand Gulch and its prominent tributaries. Ewing is serving as tour guide in a flyover undertaken by Aspen-based conservation group EcoFlight. "This would be a national park just about anywhere in the world just for the beauty of it," Ewing said. On top of the beauty, he said, is the densest concentration of archeological resources in the United States. There are an estimated 100,000 Native American sites ranging from Anasazi ruins — kivas, cliff dwellings and granaries perched in slight indents in cliffs — to rock art and pottery that tells the story of the Ancient Ancestors of modern tribes. The area currently has special protections as a 1.35 million acre national monument, created by President Barack Obama during the waning days of his administration in December 2016. It's protected from oil and gas development as well as coal and uranium mining. Looting pottery and other artifacts is subject to stiff penalties. Although the monument was created after extensive public input, President Donald Trump is poised to announce in Salt Lake City today that he intends to shrink the boundary. The Washington Post reported Bears Ears would be reduced by 85 percent from 1.35 million acres to 201,397. The Grand Staircase-Escalante National Monument, west of Bears Ears, will be reduced from nearly 1.9 million acres to 997,490, the newspaper reported. Critics of the monument, including many state and local politicians in Utah, contend the creation of the monument represents federal government overreach. They want more control over the land, including the ability to tap the natural resources and fuel their economies. Conservation groups as well as the Navajo Nation, Hopi, Zuni, Ute Mountain Ute and Ute Indian Tribe are fighting to preserve the monument. Mark Maryboy, a Navajo leader, didn't mince words about his interpretation of what has happened since Mormon settlers first came to the area in 1879. "They have done a horrible job of protecting the area," he said. They have little understanding about Navajo culture and little regard for Native Americans' feelings about the area being sacred. "Since the day they came, it's been destruction — looting, looting, looting," Maryboy said. He saved particular ire for Trump. "He's a quart low — that's what Navajos say about him," Maryboy said. Vaughn and Marcia Hadenfeldt, original owners of Summit Canyon Mountaineering in Glenwood Springs, left the Roaring Fork Valley in the early 1990s after they fell in love with Cedar Mesa and other landscapes that comprise the Bears Ears. They started Far Out Expeditions, and Vaughn has guided people into canyon country for 35 years. Hadenfeldt is on the board of directors of Friends of Cedar Mesa. He said his main concern over Trump's shrinking the boundary is "we'll go into this big void of protection." Visitation to the area has soared, particularly over the past five years, he said. Social media and now the monument designation have attracted attention. Visitors will continue to come, he said, even if the protections are lessened. He fears the outcome. "It truly is the crown jewel of archeological sites in the U.S.," Hadenfeldt said. It's a favorite haunt of many Aspen-area adventurers because of the day hiking and backpacking. The landscape is remarkably varied — from the soaring Abajo Mountains on the north, jagged Comb Ridge on the east, the mesas of Valley of the Gods to the south and deep gulches to the west. Friends of Cedar Mesa will step up education efforts and protection programs regardless of how the fight over the monument turns out. EcoFlight has been engaged for years on decision-making on Bears Ears. It flew journalists and policymakers over the landscape when the concept of the monument was raised. This year alone it has flown 50 flights over the area to help spur greater understanding of why the area is special, according to Jane Pargiter, vice president. 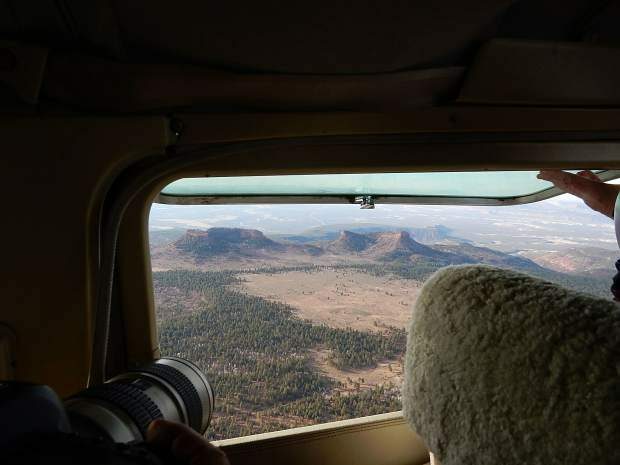 Aspen flight instructor Gary Kraft is a regular pilot for EcoFlight and has made numerous trips over Bears Ears, including three Sunday. He said he learns something new every time he flies over the magnificent landscape. Up in the air Sunday, Ewing points out where the last operating uranium-processing mill is poised on the eastern edge of the monument. Some Utah politicians dream of returning to the Cold War era and harvesting vast amounts of uranium, he said. A portion of Bears Ears lands has uranium deposits, so they are getting carved out of the monument. Friends of Cedar Mesa and its allied organizations feel that is a misguided step since uranium prices are so low and deposits are so much easier to mine elsewhere. Conservationists also dismiss the idea that oil and gas reserves are lucrative enough to carve up Bears Ears. "Honestly, I think it's just pure politics," Ewing said of the decision to shrink the monument boundary. Utah officials covet the lands and don't want the feds making decisions, he said. Maryboy and Ewing said Trump's decision wouldn't be the final word over Bears Ears. "There will be lawsuits almost immediately," said Ewing, saying Friends of Cedar Mesa will follow the lead of the Native American tribes. "The tribes will file first. They may even file (today)," he said.